The warmth of wood in a beautifully engineered aluminium batten. Koshi Ever Art Wood® looks like wood, textured like wood, in a light weight, dimensionally accurate, virtually maintenance free, fire rated aluminium. The Koshi batten is a standard hollow section that replicates a plain timber batten with no special fixtures or fittings. Profiles perform well when tested to AS/NZ 1530.3 (spread of flame / index 0) and AS/NZ 3837-1998 (result / Group 1). All dimensions are width x depth unless otherwise indicated. Batten lengths are available in standard 4m or 6m lengths and can be cut to length at no additional charge. For large quantities battens lengths can be made to order to reduce wastage and minimise cost. 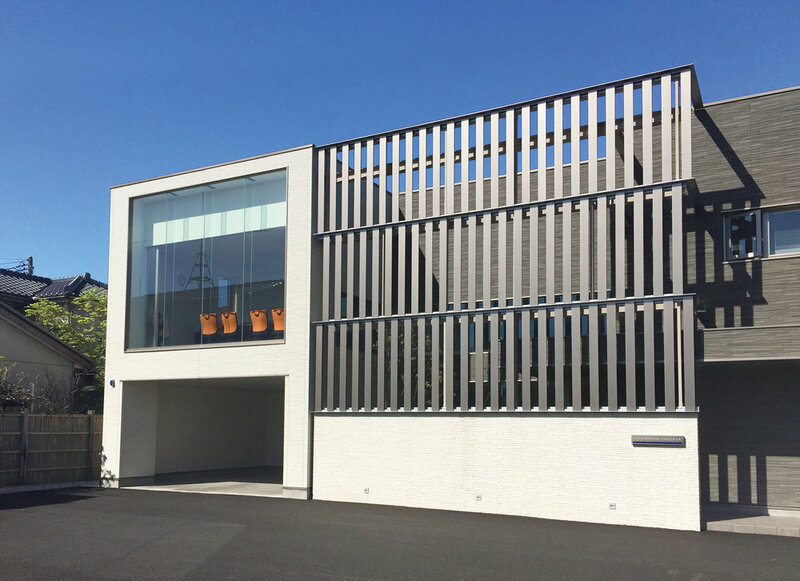 Allow 8-12 weeks lead time as our timber look aluminium cladding is made to order in Japan. Refer to individual product guides for further details. There is no recommended fixing methodology for Koshi battens. It is simply a standard hollow aluminium section as an alternative to timber battens. However, there are 3 fixing systems that can be paired with the Koshi Ever Art Wood® to create batten screens or panels. A semi-concealed fix batten screen formed on site with a T2C bracket. Only screws joining the 'T' & 'C' sections are visible. A window framed batten screen that has subtle, visible screws. The frame does not include any bracket system for fixing to a structure. A concealed fix batten screen with no visible screws. Prefabricated and delivered to site in one piece, the Dobuchi screen does not include any bracket system for fixing to a structure. Please consult your specifier or builder as to the best fixing method for your project needs. A palette created from actual timber species and metals delivers exceptional, photorealistic designs and textured effects. * Denotes colours with texture. Please note: screen reproduction for colour will not be exact. Ever Art Wood® 30mm Koshi battens in Supuringu Oku, bent to a radius of 1200mm. Ever Art Wood® 30mm Koshi battens in Supuringu Oku. Please call to speak with one of our team. You can also get in touch by using the contact form.